Here is something new to add to a list of awesome and crazy things that Siri can do. 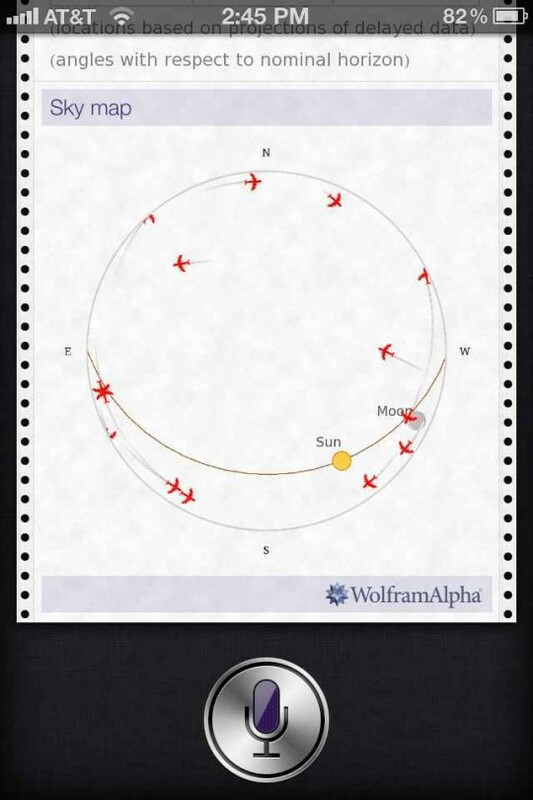 With the magic of Wolfram Alpha, Siri on the iPhone 4S is able to give you flight path trajectories. 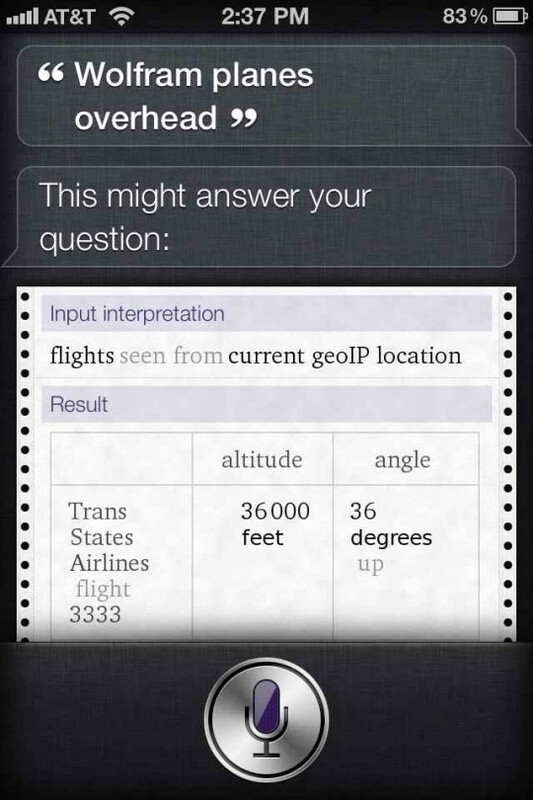 Amazingly, Siri can use your iPhone’s GPS data to determine if there are planes currently flying about in your area. Wolfram Alpha has just recently started incorporating flight data from the Federal Aviation Administration. That means that Siri can give you a flight’s speed, heading, and altitude with a five-minute delay from the real-time trajectory data. You are also provided with each flight’s plane type, slant distance, and a comprehensive sky map. If you say “Wolfram flights overheard” to Siri, you will get various flight details from different airlines in your area. Not only does Siri give you the altitude of each flight above your head, but Wolfram Alpha provides the exact angle of where the flight is located in the sky in relation to your iPhone 4S. As of right now, a flight must have at least one endpoint in the US to be recognized in Wolfram Alpha, so international flight tracking is limited. This feature is also implemented in Wolfram Alpha’s new Travel Assistant App for iOS. The app lets you find all kinds of flight data and general tourism information, including flight arrival and delay times. Travel Assistant is available as a universal download for the iPhone and iPad in the App Store for $4.99.